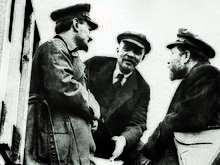 This article is about the Bolshevik faction in the RSDLP 1903–1912. For other uses, see Bolshevik (disambiguation). The Bolsheviks,[a] also known in English as Bolshevists,[b] were a faction of the Marxist Russian Social Democratic Labour Party (RSDLP) which split apart from the Menshevik faction[c] at the Second Party Congress in 1903. The RSDLP was a revolutionary socialist political party formed in 1898 in Minsk, Belarus to unite the various revolutionary organisations of the Russian Empire into one party. In the Second Party Congress vote, the Bolsheviks won on the majority of important issues, hence their name (bolshinstvo means "majority" in Russian). They ultimately became the Communist Party of the Soviet Union. [d] The Bolsheviks, or Reds, came to power in Russia during the October Revolution phase of the Russian Revolution of 1917 and founded the Russian Soviet Federative Socialist Republic (RSFSR). With the Reds defeating the Whites and others during the Russian Civil War of 1917–1922, the RSFSR became the chief constituent of the Soviet Union (USSR) in December 1922. The Bolsheviks, founded by Vladimir Lenin and Alexander Bogdanov, were by 1905 a major organization consisting primarily of workers under a democratic internal hierarchy governed by the principle of democratic centralism. They considered themselves the leaders of the revolutionary working class of Russia. Their beliefs and practices were often referred to as Bolshevism. 2 Derogatory usage of "Bolshevik"
2.1 Non-Russian/Soviet groups having used the name "Bolshevik"
In the 2nd Congress of the RSDLP which was held in Brussels and then London during August 1903, Lenin and Julius Martov disagreed over the membership rules. Lenin wanted members who financially supported the party[verification needed] and personally participated in it. Martov suggested "by regular personal assistance under the direction of one of the party's organisations". [clarification needed] Lenin advocated limiting party membership to a smaller core of active members as opposed to card carriers who might only be active in party branches from time to time or not at all. This active base would develop the cadre, a core of professional revolutionaries, consisting of loyal communists who would spend most of their time organising the party toward a mass revolutionary party capable of leading a workers' revolution against the Tsarist autocracy. A main source of the factions could be directly attributed to Lenin's steadfast opinion and what was described by Plekhanov as his inability to "bear opinions which were contrary to his own". It was obvious[to whom?] at early stages in Lenin's revolutionary practices that he would not be willing to concede on any party policy that conflicted with his own predetermined ideas. It was the loyalty that he had to his own self-envisioned utopia that caused the party split. Lenin was seen even by fellow party members as being so narrow-minded that he believed that anyone who didn't follow him was his enemy. Leon Trotsky, one of Lenin's fellow revolutionaries (though they had differing views as to how the revolution and party should be handled), compared Lenin in 1904 to the French revolutionary Maximilien Robespierre. Lenin's view of politics as verbal and ideological warfare and his inability to accept criticism even if it came from his own dedicated followers was the reason behind this accusation. The root of the split was a book titled What Is To Be Done? that Lenin wrote while serving a sentence of exile. In Germany, the book was published in 1902. In Russia, strict censorship outlawed its publication and distribution. One of the main points of Lenin's writing was that a revolution can only be achieved by the strong leadership of one person (or of a very select few people) over the masses. After the proposed revolution had successfully overthrown the government, this individual leader must release power to allow socialism to fully encompass the nation. Lenin also wrote that revolutionary leaders must dedicate their entire lives to the cause in order for it to be successful. Lenin said that if professional revolutionaries did not maintain control over the workers, then they would lose sight of the party's objective and adopt opposing beliefs, even abandon the revolution entirely. Lenin's view of a socialist intelligentsia showed that he was not a complete supporter of Marxist theory, which also created some party unrest. For example, Lenin agreed with the Marxist idea of eliminating social classes, but in his utopian society there would still be visible distinctions between those in politics and the common worker. Most party members considered unequal treatment of workers immoral and were loyal to the idea of a completely classless society, therefore Lenin's variations caused internal dissonance. Although the party split of Bolsheviks and Mensheviks would not become official until 1903, the differences originally began to surface with the publication of What Is To Be Done?. Through the influence of the book, Lenin also undermined another group of reformers known as "Economists", who were pushing for economic reform while wanting to leave the government relatively unchanged and who failed to recognize the importance of uniting the working population behind the party's cause. Other than the debate between Lenin and Martov, Lenin felt membership should require support of the party program, financial contributions and involvement in a party organization whereas Martov did not see the need for joining Party organizations, internal unrest also rose over the structure that was best suited for Soviet power. As discussed in What Is To Be Done?, Lenin firmly believed that a rigid political structure was needed to effectively initiate a formal revolution. This idea was met with opposition from his once close followers including Julius Martov, Georgy Plekhanov, Leon Trotsky and Pavel Axelrod. [page needed] Plekhanov and Lenin's major dispute arose addressing the topic of nationalizing land or leaving it for private use. Lenin wanted to nationalize to aid in collectivization whereas Plekhanov thought worker motivation would remain higher if individuals were able to maintain their own property. Those who opposed Lenin and wanted to continue on the Marxist path towards complete socialism and disagreed with his strict party membership guidelines became known as "softs" while Lenin supporters became known as "hards". The base of active and experienced members would be the recruiting ground for this professional core. Sympathizers would be left outside and the party would be organised based on the concept of democratic centralism. Martov, until then a close friend of Lenin, agreed with him that the core of the party should consist of professional revolutionaries, but he argued that party membership should be open to sympathizers, revolutionary workers and other fellow travellers. The two had disagreed on the issue as early as March–May 1903, but it was not until the Congress that their differences became irreconcilable and split the party. At first, the disagreement appeared to be minor and inspired by personal conflicts. For example, Lenin's insistence on dropping less active editorial board members from Iskra or Martov's support for the Organizing Committee of the Congress which Lenin opposed, the differences grew and the split became irreparable. The two factions were originally known as "hard" (Lenin's supporters) and "soft" (Martov's supporters), but the terminology soon changed to "Bolsheviks" and "Mensheviks", from the Russian bolshinstvo ("majority") and menshinstvo ("minority"). On the other hand, Martov's supporters won the vote concerning the question of party membership. Neither Lenin nor Martov had a firm majority throughout the Congress as delegates left or switched sides. At the end, the Congress was evenly split between the two factions. From 1907 on, English language articles sometimes used the term "Maximalist" for "Bolshevik" and "Minimalist" for "Menshevik", which proved confusing since there was also a "Maximalist" faction within the Russian Socialist Revolutionary Party in 1904–1906 (which after 1906 formed a separate Union of Socialists-Revolutionaries Maximalists) and then again after 1917. The average party member was very young. In 1907, 22% of Bolsheviks were under 20, 37% were 20–24 and 16% were 25–29. By 1905, 62% of the members were industrial workers (3% of the population in 1897). 22% of Bolsheviks were gentry (1.7% of the total population), 38% were uprooted peasants, compared with 19% and 26% for the Mensheviks. In 1907, 78.3% of the Bolsheviks were Russian and 10% were Jewish (34% and 20% for the Mensheviks). Total membership was 8,400 in 1905, 13,000 in 1906 and 46,100 by 1907 (8,400, 18,000 and 38,200 for the Mensheviks). By 1910, both factions together had fewer than 10,000 members. The two factions were in a state of flux in 1903–1904 with many members changing sides. The founder of Russian Marxism, Georgy Plekhanov, who was at first allied with Lenin and the Bolsheviks, parted ways with them by 1904. Trotsky at first supported the Mensheviks, but he left them in September 1904 over their insistence on an alliance with Russian liberals and their opposition to a reconciliation with Lenin and the Bolsheviks. He remained a self-described "non-factional social democrat" until August 1917, when he joined Lenin and the Bolsheviks as their positions assembled and he came to believe that Lenin was right on the issue of the party. All but one member of the Central Committee were arrested in Moscow in early 1905. The remaining member, with the power of appointing a new one, was won over by the Bolsheviks. The lines between the Bolsheviks and the Mensheviks hardened in April 1905 when the Bolsheviks held a Bolsheviks-only meeting in London, which they called the 3rd Party Congress. 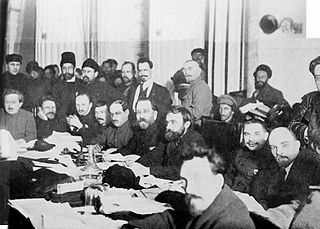 The Mensheviks organised a rival conference and the split was thus finalized. The Bolsheviks played a relatively minor role in the 1905 Revolution and were a minority in the Saint Petersburg Soviet of Workers' Deputies led by Trotsky. However, the less significant Moscow Soviet was dominated by the Bolsheviks. These Soviets became the model for those formed in 1917. As the Russian Revolution of 1905 progressed, Bolsheviks, Mensheviks and smaller non-Russian social democratic parties operating within the Russian Empire attempted to reunify at the 4th (Unification) Congress of the RSDLP held in April 1906 at Folkets hus, Norra Bantorget in Stockholm. When the Mensheviks struck an alliance with the Jewish Bund, the Bolsheviks found themselves in a minority. However, all factions retained their respective factional structure and the Bolsheviks formed the Bolshevik Centre, the de facto governing body of the Bolshevik faction within the RSDLP. At the Fifth Congress held in London in May 1907, the Bolsheviks were in the majority, but the two factions continued functioning mostly independently of each other. Tensions had existed between Lenin and Alexander Bogdanov from as early as 1904. Lenin had fallen out with Nikolai Valentinov after the latter had introduced him to Ernst Mach's Empiriocriticism, a viewpoint that Bogdanov had been exploring and developing as Empiriomonism. Having worked as co-editor with Plekhanov on Zayra he had come to agree with the latter's rejection of Bogdanov's Empiriomonism. With the defeat of the revolution in mid-1907 and the adoption of a new, highly restrictive election law, the Bolsheviks began debating whether to boycott the new parliament known as the Third Duma. Lenin, Grigory Zinoviev, Lev Kamenev and others argued for participating in the Duma while Bogdanov, Anatoly Lunacharsky, Mikhail Pokrovsky and others argued that the social democratic faction in the Duma should be recalled. The latter became known as "recallists" (otzovists in Russian). A smaller group within the Bolshevik faction demanded that the RSDLP central committee should give its sometimes unruly Duma faction an ultimatum, demanding complete subordination to all party decisions. This group became known as "ultimatists" and was generally allied with the recallists. With most Bolshevik leaders either supporting Bogdanov or undecided by mid-1908 when the differences became irreconcilable, Lenin concentrated on undermining Bogdanov's reputation as a philosopher. In 1909, he published a scathing book of criticism entitled Materialism and Empirio-criticism (1909), assaulting Bogdanov's position and accusing him of philosophical idealism. In June 1909, Bogdanov proposed the formation of Party Schools as Proletarian Universities at a Bolshevik mini-conference in Paris organised by the editorial board of the Bolshevik magazine Proletary in June 1909. However, this was not accepted and Lenin tried to expel him from the Bolshevik faction. Bogdanov was then involved with setting up Vpered, which ran the Capri Party School from August to December 1909. With both Bolsheviks and Mensheviks weakened by splits within their ranks and by Tsarist repression, they were tempted to try to re-unite the party. In January 1910, Leninists, recallists and various Menshevik factions held a meeting of the party's Central Committee in Paris. Kamenev and Zinoviev were dubious about the idea, but they were willing to give it a try under pressure from conciliatory Bolsheviks like Victor Nogin. One of the more underlying reasons that aided in preventing any reunification of the party was the Russian police. The police were able to infiltrate both parties' inner circles by sending in spies who then reported on the opposing party's intentions and hostilities. This allowed the tensions to remain high between the Bolsheviks and Mensheviks. In turn, it prevented them from uniting on common ground which could have possibly sped up the entire revolution. Lenin was firmly opposed to any re-unification, but was outvoted within the Bolshevik leadership. The meeting reached a tentative agreement and one of its provisions made Trotsky's Vienna-based Pravda a party-financed central organ. Kamenev, Trotsky's brother-in-law, was added to the editorial board from the Bolsheviks, but the unification attempts failed in August 1910 when Kamenev resigned from the board amid mutual recriminations. The factions permanently broke off relations in January 1912 after the Bolsheviks organised a Bolsheviks-only Prague Party Conference and formally expelled Mensheviks and recallists from the party. As a result, they ceased to be a faction in the RSDLP and instead declared themselves an independent party, called Russian Social Democratic Labour Party (Bolsheviks) – or RSDLP(b). Unofficially, the party has been referred to as the Bolshevik Party. Throughout the century, the party adopted a number of different names. In 1918, RSDLP(b) became All-Russian Communist Party (Bolsheviks) and remained so until 1925. From 1925–1952, the name was All-Union Communist Party (Bolsheviks) and from 1952–1991 Communist Party of the Soviet Union. As the party split became permanent and politically recognized in 1912 due to an all Bolshevik meeting of Congress, further divisions became evident. One of the most notable differences was how each faction decided to fund its revolution. The Mensheviks decided to fund their revolution through membership dues while Lenin often resorted to much more drastic measures since he required a higher budget. One of the common methods the Bolsheviks used was committing bank robberies, one of which in 1907 resulted in the party gaining over 250,000 roubles which is the equivalent of about $125,000. Bolsheviks were in constant need of money because Lenin practised his beliefs exercised in his writings that revolutions must be led by individuals who devote their entire life to the cause. To compensate, he awarded them with salaries for their sacrifice and dedication. This measure was taken to help ensure that the revolutionists stayed focused on their duties and motivated them to perform their jobs. Lenin also used the party money to print and copy pamphlets which were distributed in cities and at political rallies in attempts to expand their operations. This was an obvious difference between the Bolsheviks and Mensheviks party beliefs. Both factions also managed to gain funds simply by receiving donations from wealthy supporters. Further differences in party agendas became evident as the beginning of World War I loomed near. Joseph Stalin was especially eager for the start of the war, hoping that it would turn into a war between classes or essentially a Russian Civil War. This desire for war was fuelled by Lenin's vision that the workers and peasants would resist joining the war effort and therefore be more compelled to join the socialist movement. Through the increase in support, Russia would then be forced to withdraw from the Allied powers in order to resolve her internal conflict. 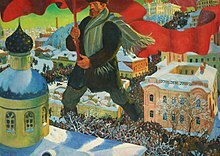 Unfortunately for the Bolsheviks, Lenin's assumptions were incorrect and despite his and the party's attempts to push for a civil war through involvement in two conferences in 1915 and 1916 in Switzerland it remained in the minority in calling for the ceasefire by the Russian Army in World War I. Although the Bolshevik leadership decided to form a separate party, convincing pro-Bolshevik workers within Russia to follow suit proved difficult. When the first meeting of the Fourth Duma was convened in late 1912, only one out of six Bolshevik deputies, Matvei Muranov (another one, Roman Malinovsky, was later exposed as an Okhrana agent), voted to break away from the Menshevik faction within the Duma on 15 December 1912. The Bolshevik leadership eventually prevailed and the Bolsheviks formed their own Duma faction in September 1913. One final difference between the Bolsheviks and Mensheviks was how ferocious and tenacious the party was willing to be in order to achieve its goals. Lenin was open minded to retreating on political ideas if he saw the guarantee of long term gains benefiting the party. This practice was commonly seen trying to recruit peasants and uneducated workers by promising them how glorious life would be after the revolution while granting them temporary concessions. In 1918, the party renamed itself the Russian Communist Party (Bolsheviks) at Lenin's suggestion. In 1925, this was changed to All-Union Communist Party (Bolsheviks). At the 19th Party Congress in 1952 the Bolshevik Party was renamed the Communist Party of the Soviet Union according to Stalin's suggestion. "Bolo" was a derogatory expression for Bolsheviks used by British service personnel in the North Russian Expeditionary Force which intervened against the Red Army during the Russian Civil War. Adolf Hitler, Joseph Goebbels and other Nazi leaders used it in reference to the worldwide political movement coordinated by the Comintern. During the days of the Cold War in the United Kingdom, labour union leaders and other leftists were sometimes derisively described as "Bolshies". The usage is roughly equivalent to the term "commie", "Red", or "pinko" in the United States during the same period. The term "Bolshie" later became a slang term for anyone who was rebellious, aggressive, or truculent. Non-Russian/Soviet groups having used the name "Bolshevik"
^ Russian: большевики, большевик (singular), translit. bolskeviki, bolshevik; derived from bol'shinstvo (большинство), "majority", literally meaning "one of the majority". ^ Both a synonym to "Bolshevik" and an adherent of Bolshevik policies. ^ Derived from men'shinstvo (меньшинство), "minority", which comes from men'she (меньше), "less". The split occurred at the 2nd Congress of the Russian Social Democratic Labour Party in 1903. ^ After the split, the Bolshevik party was designated as RSDLP(b) (Russian: РСДРП(б)), where "b" stands for "Bolsheviks". Shortly after coming to power in November 1917, the party changed its name to the Russian Communist Party (Bolsheviks) (РКП(б)) and was generally known as the Communist Party after that point. However, it was not until 1952 that the party formally dropped the word "Bolshevik" from its name. See Congress of the Communist Party of the Soviet Union article for the timeline of name changes. ^ "Bolsheviki Seize State Buildings, Defying Kerensky". The New York Times. 7 November 1917. Retrieved 22 December 2013. ^ "Большевистский", Ushakov's Explanatory Dictionary of Russian Language . ^ Suny, Ronald Grigor (1998). The Soviet Experiment. London: Oxford University Press. p. 57. ISBN 978-0-19-508105-3. ^ Shub 1976, p. 81. ^ Service, Robert (2010). Lenin : a biography. London: Pan. p. 154. ISBN 978-0-33051838-3. ^ Shub 1976, p. 76. ^ a b Pipes 1995, p. 104. ^ a b Pipes 1995, p. 106. ^ Stalin, J. V. (2016). History of the Communist Party of the Soviet Union (Short Course). Lulu.com. ISBN 9781329947207. ^ Stalin, Joseph. "History of the Communist Party of the Soviet Union (Bolsheviks)". www.marxists.org. ^ Tucker 1975, p. xxxviii. ^ Getzler, Israel (2003) , Martov: A Political Biography of a Russian Social Democrat, Cambridge University Press, p. 78, ISBN 0-521-52602-7 . ^ Wilson, Edmund (1977). To the Finland Station. London: Fontana. p. 402. ISBN 0-00-632420-7. ^ Antonelli, Étienne (1920), Bolshevik Russia, Charles A. Carroll trans, AA Knopf, p. 59, the term 'Maximalist' rather widely used as a translation for 'Bolshevik' is historically false. 307 pp. ^ Ascher, Abraham, The Revolution of 1905, p. 4 . ^ Cliff, Tony, Lenin and the Revolutionary Party, p. 37 . ^ Pipes, Richard, The Russian Revolution, pp. 364–5 . ^ McDaniel, Tim, Autocracy, capitalism, and revolution in Russia, p. 246 . ^ Biggart, John (1989). Alexander Bogdanov, left-Bolshevism and the Proletkult 1904–1932. Norwich: University of East Angla. ASIN B001ON1IY4. ^ Wolfe, Bertram D. (1966). Three Who Made a Revolution. London: Penguin. p. 410. ISBN 0-14-020783-X. ^ Materialism & Empiriocriticism, Moscow: Zveno Publishers, May 1909 . ^ Woods, Alan (1999), "Part Three: The Period of Reaction", Bolshevism: The Road to Revolution, Wellred, ISBN 1-900007-05-3 . ^ Daniels, Robert V, ed. (1993), A Documentary History of Communism in Russia, UPNE, p. 33, ISBN 0-87451-616-1 . ^ Marot, John Eric (July 1990). "Alexander Bogdanov, Vpered, and the Role of the Intellectual in the Workers' Movement". Russian Review. Blackwell. 49 (3 (Special Issue on Alexander Bogdanov)): 241–64. JSTOR 130152. ^ Pipes 1995, p. 109. ^ a b c Pipes 1995, p. 108. ^ ORT-Ginzburg (2003). "The Constituent Assembly". St. Petersburg's Jews: Three Centuries of History. ^ a b Pipes 1995, p. 111. ^ McKean, Robert B (1990), St. Petersburg Between the Revolutions: workers and revolutionaries, June 1907 – February 1917, New Haven: Yale University Press, pp. 140–1 . ^ "North Russian Expeditionary Force 1919, Scrapbook Diary, Photographs, Mementoes", Naval History, retrieved 14 June 2012 . ^ Collins Mini Dictionary, 1998. ^ "bolshie". The free dictionary. Retrieved 8 March 2014. Pipes, Richard (1995), A concise History of the Russian Revolution, New York, ISBN 978-0-679-42277-8 . Shub, David (1976), Lenin : a biography (rev. ed. ), Harmondsworth: Penguin, ISBN 978-0-14020809-2 . Tucker, Robert (1975), The Lenin Anthology, New York: WW Norton & Co, ISBN 978-0-393-09236-3 . Wikimedia Commons has media related to Bolsheviks. Look up Bolshevik or Bolshevism in Wiktionary, the free dictionary. Wikisource has the text of the 1922 Encyclopædia Britannica article Bolshevism. Woods, Alan, Bolshevism, the Road to Revolution, Marxist . "Chronology of the Bolshevik Party World History Database", Dates of History . Brinton, Maurice, The Bolsheviks and Workers Control, Libcom . The Practice and Theory of Bolshevism at Project Gutenberg by Bertrand Russell, November 1920. Bobrovskaya, Cecilia, Twenty Years in Underground Russia: Memoirs of a Rank-and-File Bolshevik, Marxists, archived from the original on 25 February 2003 . Schulman, Jason (28 December 2017), "Bolshevism, Real and Imagined", Jacobin .